Jon Stewart loves a Mitt Romney gaffe. "This is awesome: A Mormon gambling with an evangelical over who's the bigger liar!" he said of Romney's infamous $10,000 bet remark. Late night comics finally got their chance to lay into Mitt Romney for a gaffe after he made his first big one of the GOP primary season at Saturday's debate, challenging Rick Perry to a $10,000 bet. "This is awesome: A Mormon gambling with an evangelical over who's the bigger liar!" 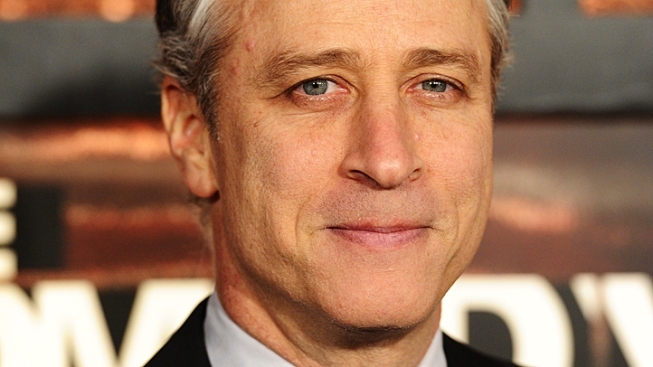 Jon Stewart remarked on "The Daily Show" Monday. "Are there any commandments left?" His senior political correspondent John Oliver explained that the joke bet only underscored the existing narrative about Romney: "Everything about Romney tells the tale of a man who just fired your dad." And Jay Leno even managed to cram Romney and LiLo into the same joke, mentioning that Lindsay Lohan's purse had just been stolen — and returned sans $10,000 in cash. "The guy who stole it needed the money to pay off a bet with Mitt Romney," joked Leno. "You what Newt Gingrich calls ten grand? A slow Tuesday at Tiffany's."